Last weekend saw us in North Cork for our first visit to Charleville. I had contacted the organiser +Micheal Herlihy during the previous week to see if there was anything +Amphibian King West could do to help support or promote the event which has been going from strength to strength since it's inception. Provide flat, straight accurately measured course to allow runners achieve their best possible time. Provide an enjoyable memorable event overall with a friendly environment on a scenic course. Provide some of the best facilities and perks of a top class race with the best chip-timing, post race reception with good food and results provided quickly post-event. As an athletics club, North Cork AC aims to provide both a high quality event for the more competitive elite and club runners while also providing an enjoyable experience for those who just want to enjoy the challenge of participating in the event without the pressure of being competitive. 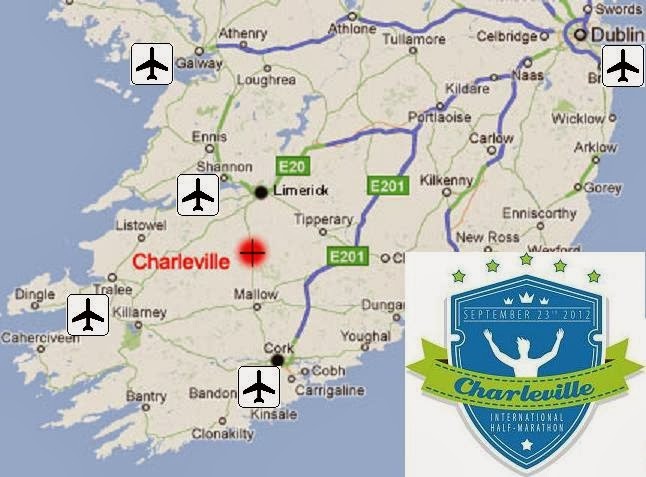 In the long term the Charleville Half Marathon aims to develop a truly top-class International standard event to take advantage of our flat course and our central location in the Munster area. I would like to thank Michael, all his fellow organisers, volunteers and marshals for making this a great event. Thank you for having us and we look forward to working with you again in 2014. Definitely a race to recommend and mark it down in your diary.